See How the Improved Content Quality Actually Saves You Money. 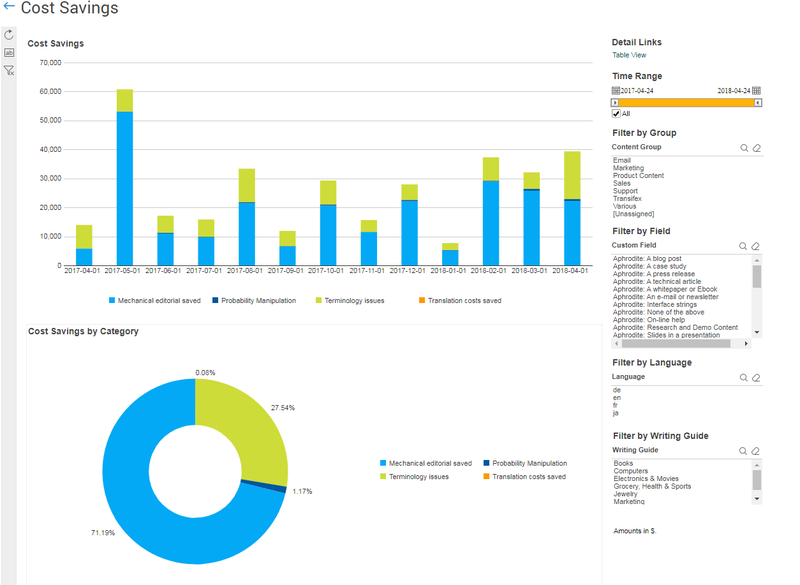 To open the Cost Savings dashboard, go to Analytics in the Acrolinx Dashboard. You'll find Cost Savings under Impact . Cost Savings View the calculated cost savings broken down by time. Cost Savings by Category View the calculated cost savings broken down by the cost savings categories you've set in Cost Savings Settings . At the upper right corner of the dashboard, you’ll find the section Detail Links. A detail link opens a detailed web report in a table. These web reports are quite handy, since you can easily filter, export, and print the content.